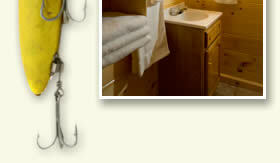 Lazy Fisherman and Fisherman's Nook are two almost identical one-bedroom cabins located directly on the water. Enjoy the beautiful Nantahala Lake and surrounding mountains from covered porches that are only a few feet from the water’s edge. 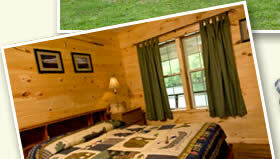 Easy access with a gentle slope to the water makes these cabins ideal for young or elderly guests. Relax inside with great views from the bedroom and living room windows or enjoy a cool evening by your gas log fireplace. The front porch is a great spot for that morning cup of coffee watching the mist over the lake. 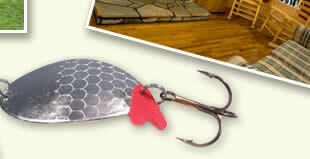 There is a large dock on the property where you can dock a boat, swim or fish. Bring your own boat, or rent one from a local marina. Each of our NC mountain cabin rentals is located within walking distance of our general store/gas station and an informal, lakeside restaurant. 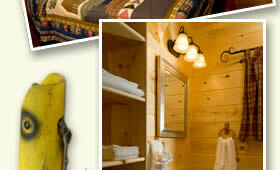 Make our Nantahala cabins your home base for the perfect Smoky Mountain vacation. Call or email to check availability or make a reservation. Credit card required to reserve rental. Full amount due at check-in. State and local taxes apply. M/C, VISA, Discover, and cash accepted. Cancellation Policy: If reservations are cancelled more than 14 days prior to stay, a $25 reservation fee will be charged. 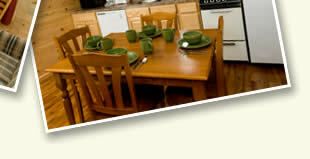 If reservations are cancelled less than 14 days prior to stay, a $25 reservation fee + a one night stay will be charged. If reservations are cancelled the day of stay, the entire amount (less cleaning/pet fees) will be charged and will be non-refundable. *Pets are welcome with prior approval.